This pattern depicts tetris pieces falling into place. 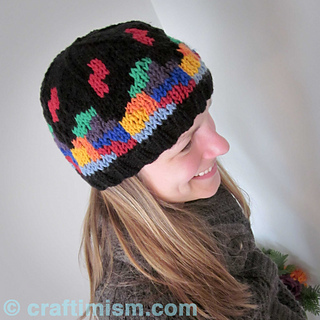 It is the perfect gift for gamers and is a very colorful hat. When knitting the colors, you must carry several colors behind the work at a time which can be a little more difficult than simple 2-stranded color work. 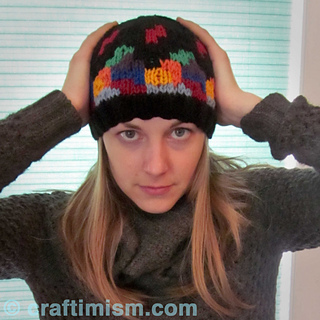 However, as long as you frequently wrap the non-worked colors around the working color behind the piece and watch your tension, you can make a warm and unique hat. 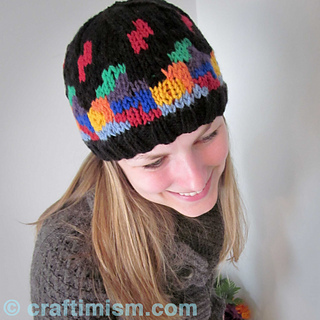 See http://www.craftimism.com/2013/12/tetris-knit-hat.html for more information and tips.